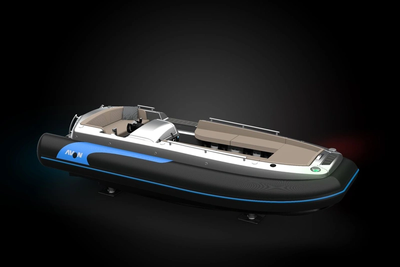 Avon (Zodiac Nautic Group) & Torqeedo launch the eJET 450, a 100 percent electric tender. After introducing the first jet tender to the world in 1991 and revamping the landscape of the luxury yacht tender through its Avon brand for over 20 years, Zodiac Nautic is doubling down on its commitment to keep exploring the future of the boating industry. Together with Germany-based Torqeedo, Avon has developed the eJET 450, a 100 percent electric tender that solves the most pressing problems faced by yacht owners: carrying fuel for tenders, changing oil, dealing with reliability issues and costly maintenance. These tenders are equipped with the most advanced 55 kW Deep Blue electric motor from Torqeedo and the latest generation of automotive battery (30.5 kWh used in the BMW i3). The eJET gets 90 minutes of range at 23 knots (7 hours at 5 knots) and achieves a max speed of 31 knots thanks to its revolutionary Hydrojet technology. The eJET products also carry connected capabilities allowing them to be maintained and upgraded directly through the Internet. True to its luxury background, Avon eJETs feature high-quality hypalon fabric, exceptional electrically-retractable seats by Serge Ferrari with a quilted finish sewn by hand in France. The range is entirely customizable with hundreds of options available.